Why was this watch shape chosen, and how was it conceived? It’s really very simple. I set out with the ambition to create a watch that was comfortable and ergonomic for all wrists, given how much their anatomy varies, as well as that of the wearers. I wanted to create a piece whose dimensions were as universal as possible. I was also keen that the watch should be felt comfortably when the opposite hand was placed on the wrist. He suddenly claps his right hand onto his left wrist, which sports a Kalpa. His face breaks into a big smile. You see? You can hardly feel the watch, yet it’s most certainly there! It blends with my wrist, from the crystal to the strap, and with each tiny movement of the case. That’s what I wanted to achieve when I created the Kalpa. A watch in perfect balance with the optimal weighted average of the human wrist. He releases his grip on the watch, but his smile never wavers. So I produced a prototype watch profile from cardboard and had those around me try it on to establish this aver- age. My family, my colleagues and all the collaborators at what was then a small manufacture got involved. When I went into the workshop, I would say « look, I’ve got some- thing for you to try, give me your wrist – what do you think of this shape? Through empirical experimentation, the ideal dimensions slowly became evident, as well as the angle for orienting the lugs and a ratio of harmonious proportions. I began to sketch the Kalpa in profile, following the curve of the wrist and, for several weeks, I worked only on the profile. The surface of the watch with its tonneau shape came next – or, rather, it imposed itself as a logical consequence of the profile. The guiding principle was no straight lines, no sharp angles – just like the wrist itself. The central theme of the design was the geometric curve that defines the domed surface of the sapphire and the gentle, shallow angles of the middle. In 2018, 20 years after the creation of the first shaped movement that powered the Kalpa’s ancestor, the iconic tonneau shaped family once again took center stage; a new generation of Kalpas boasting 100% manufacture-made complications, and featuring tonneau shaped movements perfectly adapted to their cases. This form within a form expressed Michel Parmigiani’s cherished desire to achieve complete harmony within the watch: between the movement and the case; between the concealed and the visible. The Kalpa collection followed on from the first watch movement created by Michel Parmigiani in 1998: the tonneau shaped caliber PF110. Twenty years later, the design of this movement is still just as impressive. Indicating the hours, minutes, small seconds, date and power reserve – the quintessence of time measurement – it powers the new hand-wound Kalpa Hebdomadaire. Now available as a self-winding caliber, the new PF442 was awarded Fleurier Quality Certification after undergoing a strict testing regime to certify its reliability and craftsmanship. The new Kalpa Hebdomadaire is a piece that honours the history of the Kalpa and the brand’s first movement, which was tonneau-shaped. Developed by Michel Parmigiani in 1998 and honored with an innovation award the following year, the hand-wound caliber PF110 is characterised by its impressive eight-day power reserve, made possible by the two series-mounted barrels. This remark- ably symbolic Haute Horlogerie caliber features hour and minute functions, small seconds at 6 o’clock, a date dis- play and a weekly power reserve indicator. In keeping with the other new-generation Kalpa watches, the refined design features of its mechanism – C�tes de Gen�ve pattern, beveled bridges and circular-graining – are exposed through a sapphire case-back, with the wide tonneau opening revealing its seamless integration with the case. Oscillating at a frequency of 21,600 vibrations per hour (3 Hz), this signature shaped movement is housed within a case that is no less iconic itself, crafted in 18ct rose gold and entirely hand-polished. As the face of the collection, the rich black dial delivers on many different levels, with an opaline finish in the center and on the power reserve scale, as well as a hand-worked braid-effect guilloch� detail on the flange. Equally distinctive are the luminescent Delta-shaped hands pointing to hand-applied faceted indices with a luminescent coating and the minute track in the center, while the instantaneous date display at 12 o’clock houses the famous bright red 1 numeral. The new Kalpa Hebdomadaire is water-resistant to 30 meters and attractively proportioned (42.3 x 32.1 mm), fastening neatly on the wrist with its Herm�s black alligator strap with a rose gold folding buckle, for unparalleled comfort and style. Its name contains a promise – that of proven technical and aesthetic excellence. The Kalpa Qualit� Fleurier has fulfilled the five strictest and most comprehensive certi- fication criteria in watchmaking*, attesting to its uncompromising reliability and craftsmanship. It is equipped with the new self-winding caliber PF442, which features hour, minute and central second’s indications, as well as the date at 12 o’clock. This movement houses a series-mounted double-barrel that guarantees a better distribution of energy within the caliber and increases its power reserve to 60 hours. Each component meets Haute Horlogerie standards in terms of its finish, and the bridges are decorated with a crossed C�tes de Gen�ve pattern whose complexity reflects the rigor of Fleurier Quality certification. The case in 18 carat red gold marks a departure from the brand’s customary rose gold. The black dial features an opaline and hand-guilloch� decoration around its edge with a braid-effect pattern. The Kalpa Qualit� Fleurier is distinguished by its elegant simplicity, with no detail left to chance. The ability to produce an integrated chronograph on an industrial scale is the Holy Grail for a successful watch manufacture. In 2016, Parmigiani Fleurier achieved it for the first time on a round watch: the Tonda Chronor Anniversaire. In 2018, the brand produced this complication on a shaped movement, thus celebrating the 20th anniversary of the brand’s first movement that led to the creation of the Kalpa family. This is the highlight of the new generation Kalpa. The Kalpa Chronor houses the world’s first solid gold integrated self-winding chronograph movement. This tonneau watch in hand-polished 18ct rose gold measures 48.2 x 40.4 mm and houses an exceptional mechanism that has been developed and manufactured entirely in-house over six years. The COSC-certified calibre PF365 oscillates at the high frequency of 36,000 vibrations per hour (5 Hz) to achieve a reading accuracy of one tenth of a second. With a power reserve of approximately 65 hours, this Haute Horlogerie movement equipped with a column wheel and vertical clutch – hallmarks of precision and user comfort – is distinctive for its prestigious 18ct gold construction. Malleable and particularly difficult to work, this material underlines the rare skill and expertise employed in the movement’s design, including the skeleton work on its bridges and its decoration. It also features a variable-inertia balance, held in place by a cross-through bridge, for improved stability and shock resistance. In terms of the dial, the calibre PF365 provides hour, minute, small seconds and chronograph functions with a tachymeter and date window. At the back, a wide tonneau opening with a sapphire crystal at the top show- cases this new shaped movement, wound by an oscillating weight in 22ct gold that features a barley grain guilloch� motif. The 18ct gold bipartite dial in black is elegantly finished with an opaline center, hand worked braid-effect guilloch� detail on the flange, and snailed counters. The counters have been enlarged and positioned slightly above the center point, offering easier readability, while the rounded date window with its gold outline at 12 o’clock reveals below it a disc with white numerals and a gold powder finish for the 1.The luminescent Delta hands point to hand-applied 18ct rose gold faceted indices, which also have a luminescent coating and match the folding buckle on the Herm�s black alligator strap. It is an exceptional timepiece, produced as a series of 50 numbered pieces. The stylish masculinity of this Haute Horlogerie watch lies in the form of one of the most popular horological complications: the chronograph. 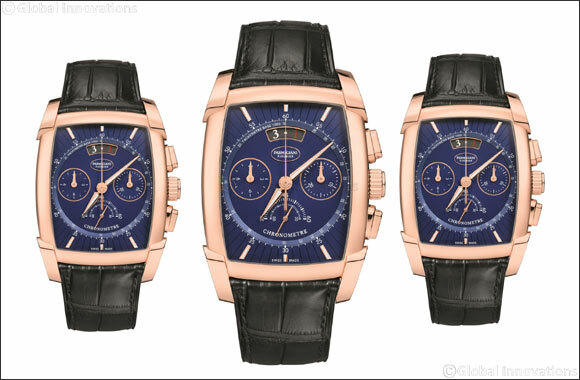 It is powered by a new shaped movement bearing the hallmarks of Parmigiani Fleurier – the calibre PF362, a COSC-certified, self-winding, integrated chronograph offering hour, minute, small seconds and chronograph functions as well as a tachymeter scale and date display, with a 65-hour power reserve. Entirely developed and manufactured in-house over a period of six years, this calibre works at a frequency of 36,000 vibrations per hour (5 Hz) and demonstrates an accuracy of one tenth of a second; it also features a column wheel and vertical clutch to ensure accuracy and user comfort. In addition, its variable-inertia balance is secured by a bridge which provides strength and stability against shocks. Seamlessly integrated with the hand-polished 48.2 x 40.4 mm tonneau case, water-resistant to 30 meters, this advanced mechanism reveals its elegant finishes through the sapphire case-back, along with the 22ct gold oscillating weight and its barley grain guilloch� motif. As for the display, the dial is divided into different levels and features a blue center treated with PVD with an opaline finish, a radial guilloche worked flange punctuated with hand-applied faceted indices, two snailed counters enclosed within a fine gold edging, an angled tachymeter scale, a semi-instantaneous date window, and a small seconds sector with its own hand. The lumi-nescent Delta-shaped hands, the counters placed slightly off center, and the rounded date indicator containing three numerals come together to form this balanced, easily readable display. The finishing touch is a black alligator strap with a rose gold folding buck.